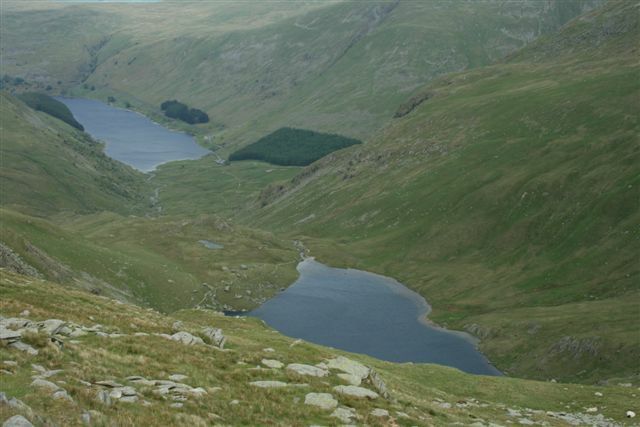 Haweswater is a reservoir built within the valley of Mardale. 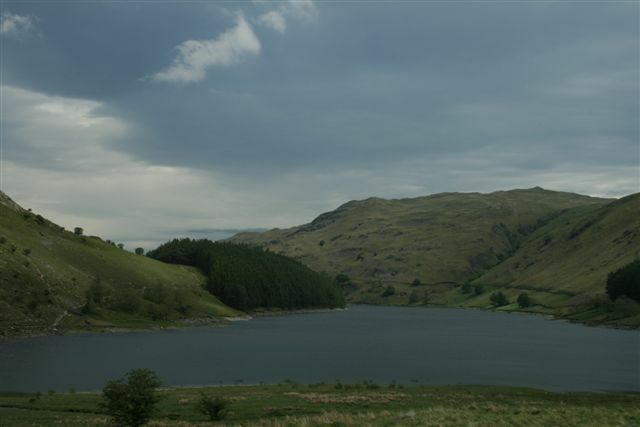 The controversial construction of the Haweswater dam was started in 1929, after parliament passed an act giving Manchester Corporation permission to build the reservoir to supply water for the urban conurbations of North West England. 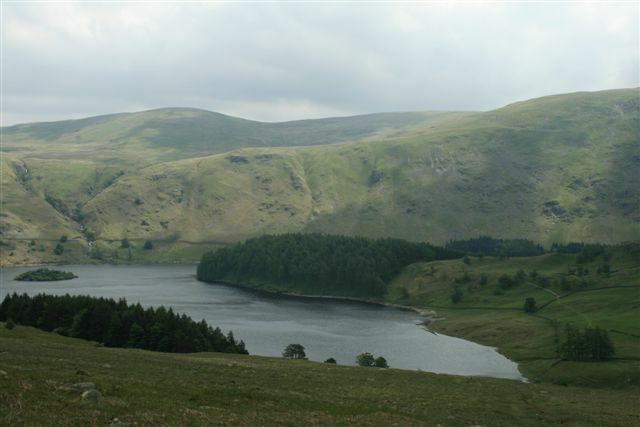 Prior to the flooding of the Mardale valley Haweswater was a natural lake, with the valley considered one of the most picturesque in Westmorland and many thought it should be left alone. 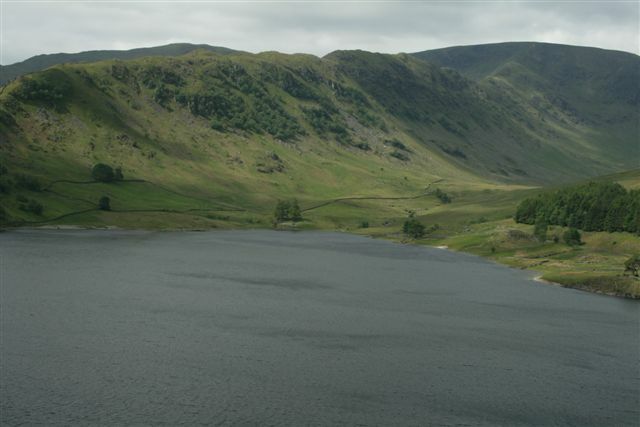 Originally before the construction of the dam Haweswater was about four kilometres long and almost divided in two by a tongue of land at Measand, with the two reaches of the lake being known as High Water and Low Water. This is now long gone with the building of the dam raising the water level by 29 metres (95 feet) and created a reservoir six kilometres (four miles) long and around 600 metres (almost half a mile) wide. 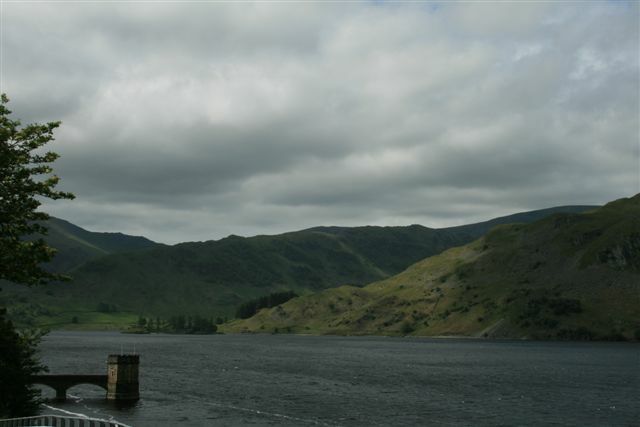 The Haweswater dam was the first hollow buttress design in the world and considered to be cutting edge technology at the time of construction and with the reservoir full it holds 84 billion litres (18.6 billion gallons) of water. The reservoir is now owned by United Utilities plc. 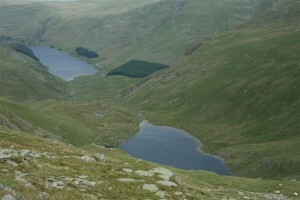 With the construction of the dam the valley of Mardale was flooded in 1935 with all the residents of the villages of Mardale Green and Measand relocating. With the construction of the reservoir and dam came a new road along the eastern side of the lake to replace the flooded road lower in the valley. 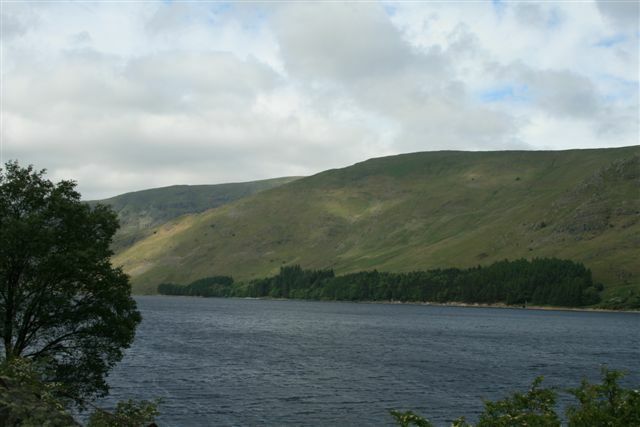 The road continues the length of the lake to the western end of Haweswater and terminates with a small car park. 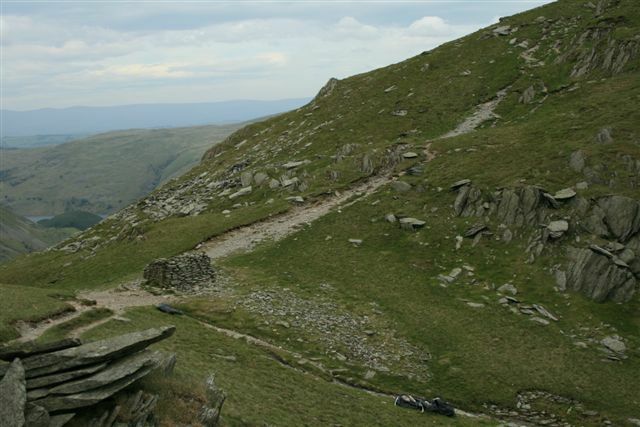 The car park is currently free and a popular starting point for walkers who wish to climb the local fells of Harter Fell walk, Branstree and the ever popular High Street walk. 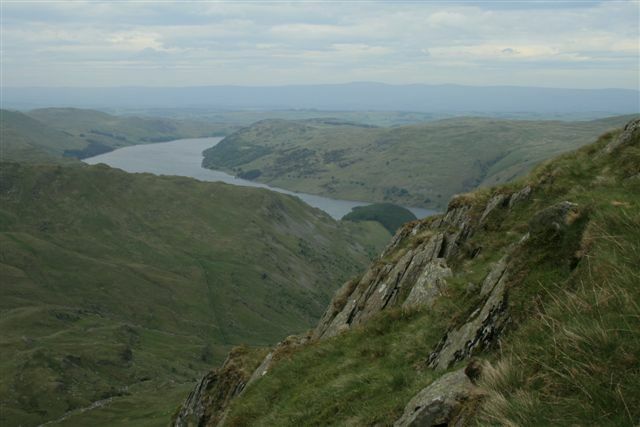 The Haweswater valley is the only place in England where golden eagles nest. There is a RSPB observation post in the valley of Riggindale, where the pair has their eyrie, although I have not sighted any eagles on my walks within this location as of writing. It is rumoured locally that the eagles are now gone and how true this is I do not know. Should you be out walking in this location and happen to spot a golden eagle please make a comment below. 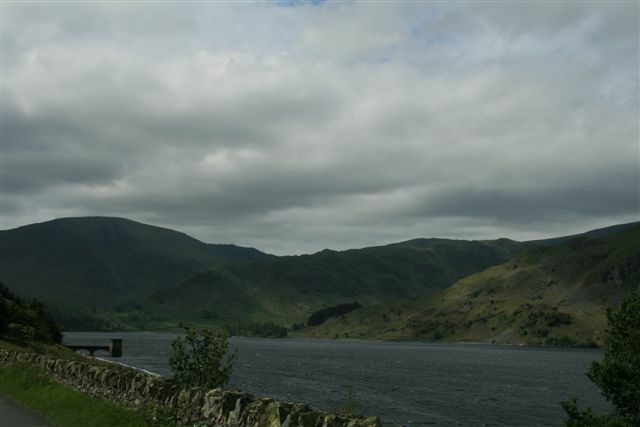 “If we can accept as absolutely necessary the conversion of Haweswater [to reservoir], then it must be conceded that Manchester have done the job as unobtrusively as possible. Mardale is still a noble valley. But man works with such clumsy hands! 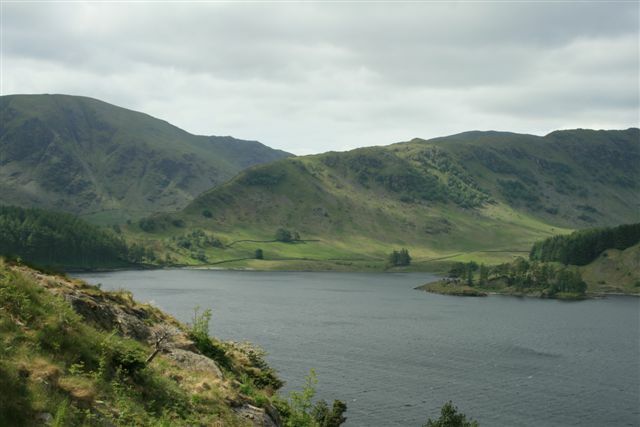 Gone for ever are the quit wooded bays and shingly shores that nature had fashioned so sweetly in the Haweswater of old; how aggressively ugly is the tidemark of the new Haweswater”. For me walking the local area of Haweswater today is a very refreshing change as fewer tourists seem to be attracted to this mini oasis of Lakeland serenity. There are no shops or tea rooms should the inevitable Lakeland heavens open with fresh clean water to downpour upon us, simply to wash away the mundane of life. Here is a place where solitude personifies and you can really hear your thoughts. For some untold reason you are happy to get wet here and unlike other walks and variations of routes a walk to the summit of High Street via Kidsty Pike holds a special thought for me. Whilst considering the words of Alfred Wainwright and the clumsy hands of man it appears that this meeting head on of man and his needs, whilst contrasting the natural beauty of the Lake District has created an environment which the golden eagles have considered beyond all others within all England, should it be the preferred home of the eagle then I too consider it home. Haweswater is a special peaceful lake and very different to all the Lakeland lakes and maybe it is at this point I advise the reader to visit Windermere? 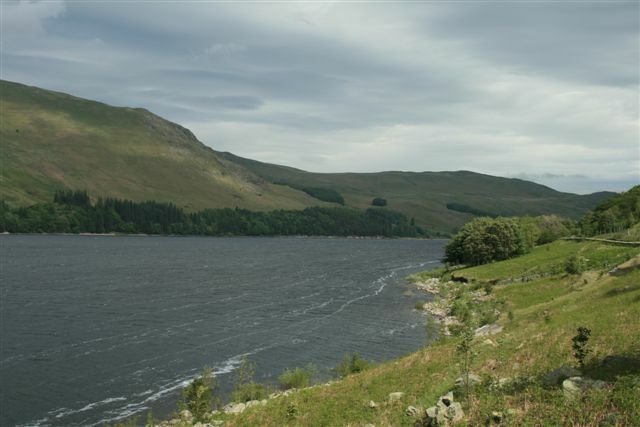 Should you wish to see better quality photographs of this Haweswater Reservoir article please visit Haweswater Reservoir on our Lake District Walks Flickr account. 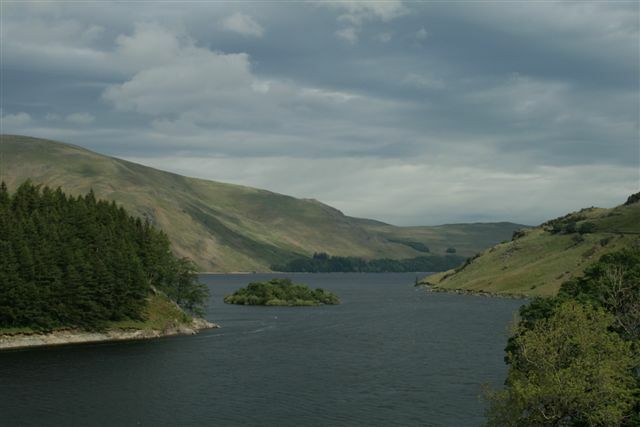 Please feel free to comment below on Haweswater Reservoir share or even hit the Face Book like button. 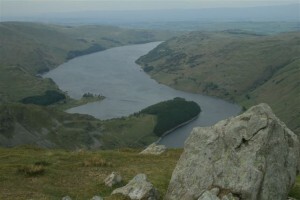 I trust you enjoyed my article on Haweswater Reservoir. 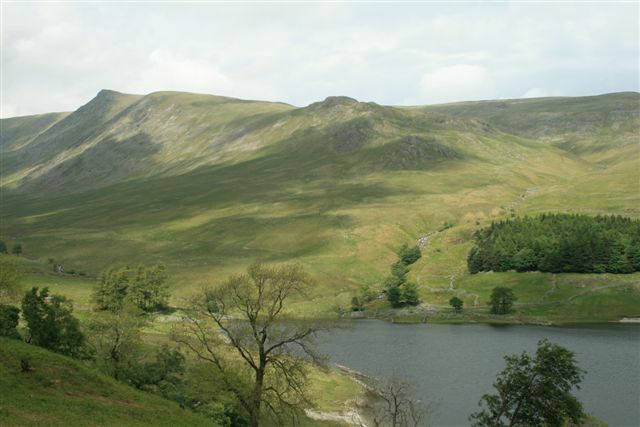 There are two fells by the name of Harter Fell within the National Park, one being situated in Eskdale (Alfred Wainwright: A Pictorial Guide to the Lakeland Fells, Book 4) and the later being at Mardale, this being the fell that is of more interest to this particular walk. 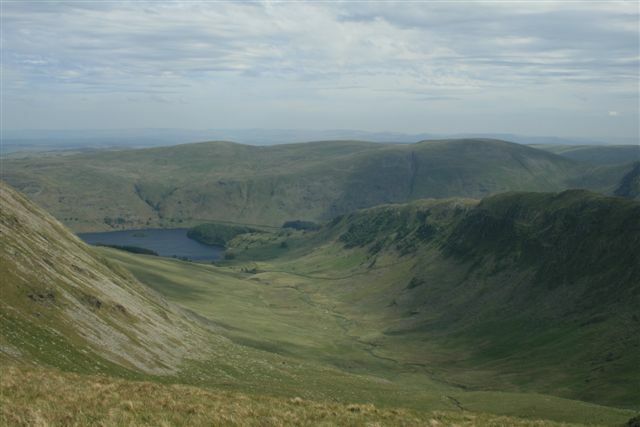 Harter Fell is most frequently climbed from Mardale Head, as there is good road access along the shore of Haweswater reservoir and currently free car parking available. 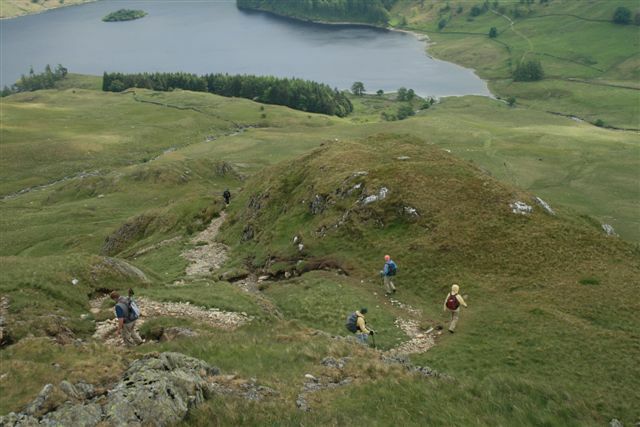 Should you be interested now in a walk to Harter Fell from Mardale and the car park at Haweswater there are several options available to you. 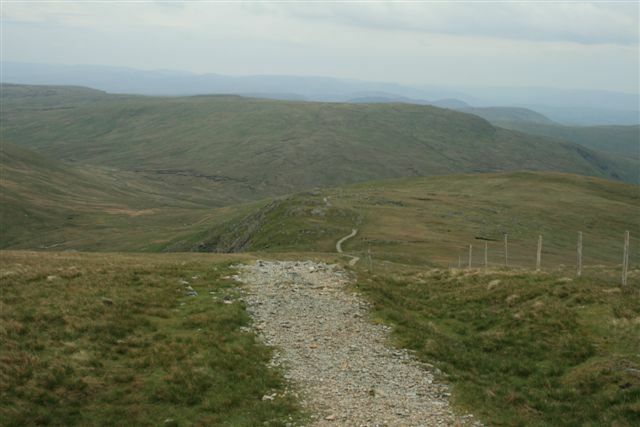 Whilst consulting the Ordnance Survey map it was my original theory to make this a circular walk going in an anti clock wise direction, starting towards ‘The Rigg’ and then heading off up ‘Kidsty Pike’ (being on the Coast to Coast route) and a larger full days walk. 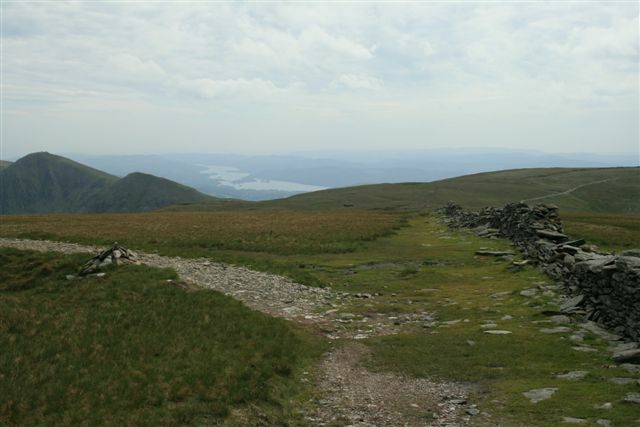 Therefore my original walk can also be read, being called ‘High Street Walk’ and incorporating the old Roman Road between the forts of Ambleside and Brougham, near Penrith a top of High Street. For the longer walk both walks need to be consulted in unison as I have now split this walk in two parts. 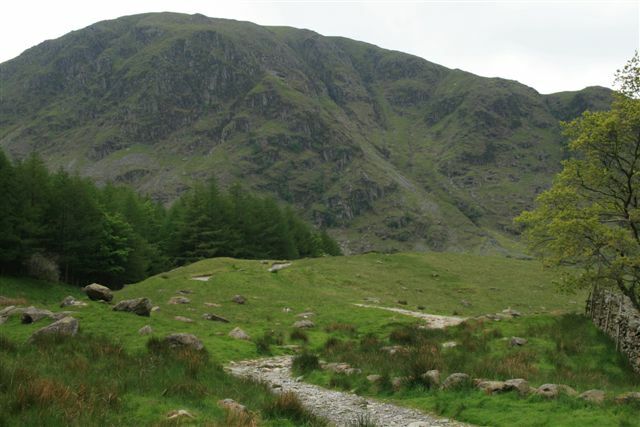 This walk is now simply to climb Harter fell via Gatescarth Pass and to descend via Small Water and approximately 4 miles in length. In uncertain weather it is always better to be able to increase or shorten any walk you undertake, and this collective walk with High Street is great for this purpose and also dependent upon personal fitness. Leaving the car park at Mardale Head go through the gate and heading in an anti clock wise direction follow the footpath to your left with the beck also on your left. 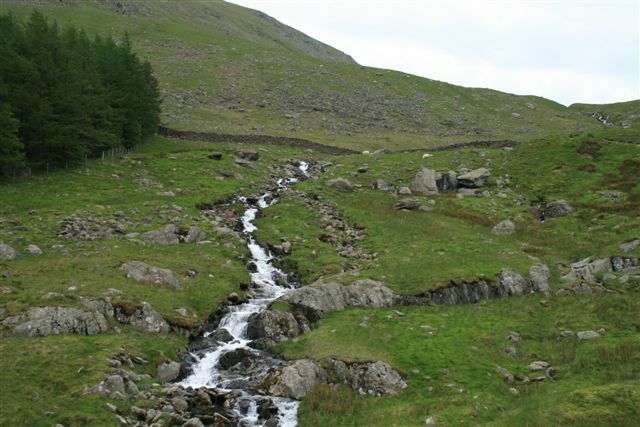 As you start you ascent of the Gatescarth Pass depending upon recent rain fall you will see some nice running stream water here which is very picturesque. 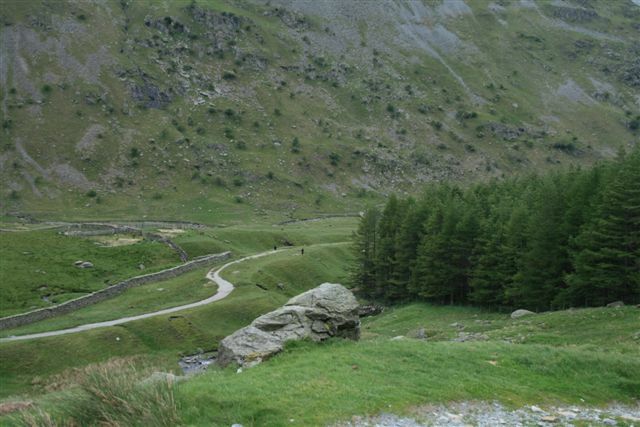 The Gatescarth Pass byway provided historic trade routes from Mardale to Kentmere and Longsledale respectively, although with the submergence of Mardale village beneath Haweswater reservoir in the 1940’s, the original purpose has died. The route still provides good excess for fell walkers. 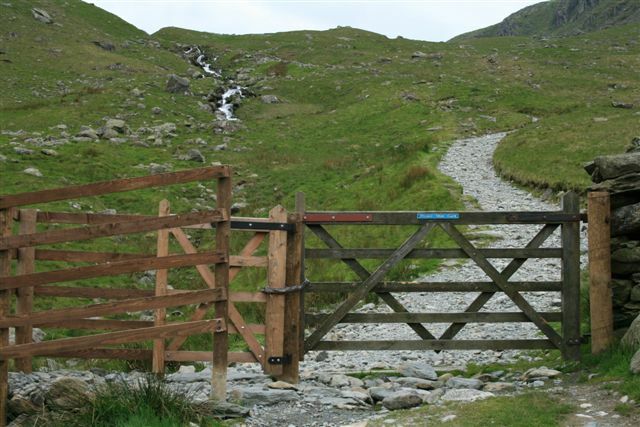 Approaching a wooden gate upon the footpath simply continue through and maintain your ascent of the pass. 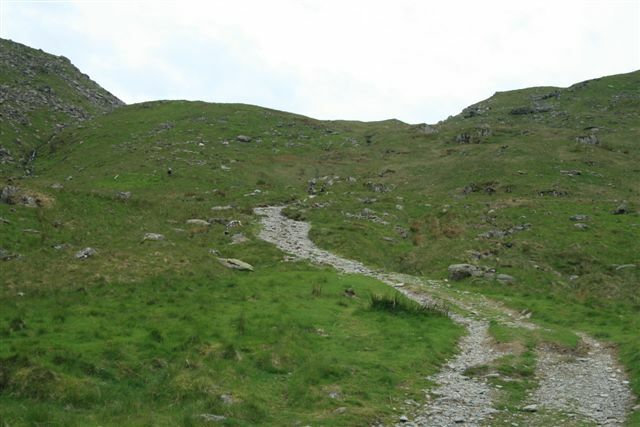 There is then a point wherein the footpath bends of to the right and begins its ascent of Harter Fell. During your walk from the car park you will have had the pleasure of looking upwards towards the crag and rocky outcrop on your right. 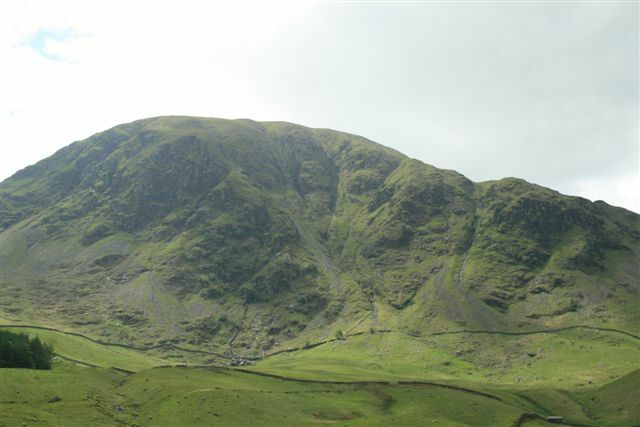 Now as you climb above the crag you will witness the difference in altitude and a new perspective of the crag that give the fells their own unique aura. 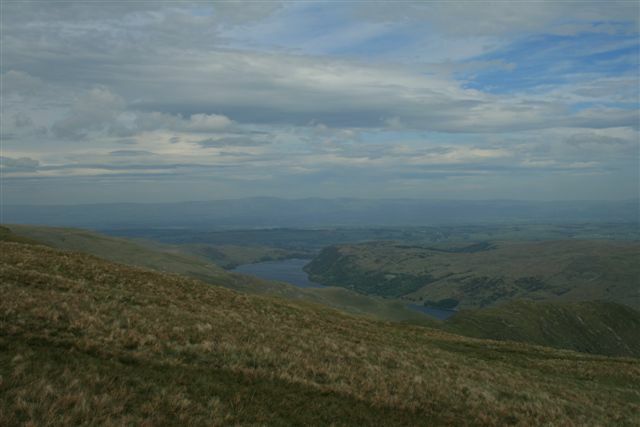 As you rise out of the pass your efforts will be greatly rewarded with stunning views of Haweswater Reservoir and The Rigg. The footpath here is good and generally follows the fence line on your left hand side. Rising up onto the shoulder of Harter fell affords good views towards Small Water and High Street behind. Travelling along the fence line the footpath is not so clear, although the route is quite obvious in its direction to the summit. The summit is marked by a cain constructed of stones and the salvaged steel posts from an old fence, and when encountered unexpectedly on a misty day, can be dangerous. The summit of Harter fell struck me as odd with rock just sticking from the surface like deposited runes from some long forgotten time. 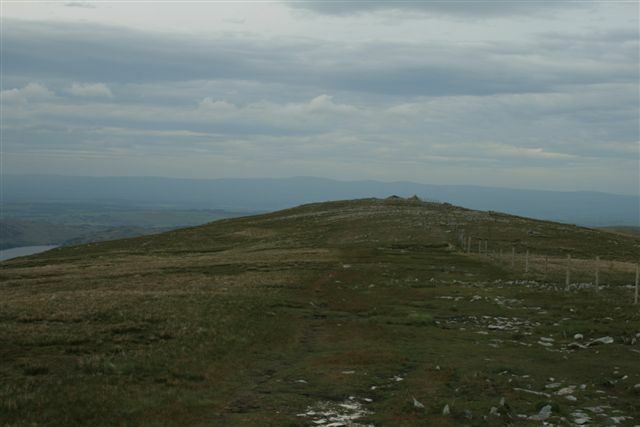 Looking from the summit it is possible to see your return route via Small Water descending down into the car park or alternatively you have a choice to extend your walk. Leaving the summit the downward path towards Nan Beild Pass is clearly visible, although a rocky descent. It is advisable on wet days to take care and not slip upon the rocks. 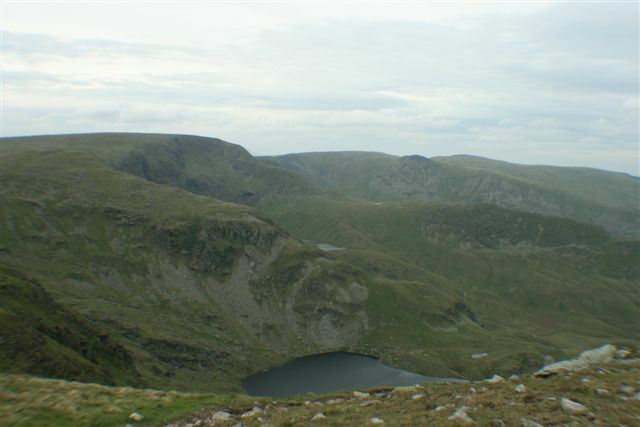 During your downward hike you will see Kentmere reservoir on your left as you approach the crossing of footpaths. The last leg of the walk will skirt the beautiful Small Water. Look out for three igloo shaped shelters as you pass the tarn. These are well built as a refuge from bad weather and a reminder that Nan Beild Pass was once a regular thoroughfare for travellers before Mardale was flooded. 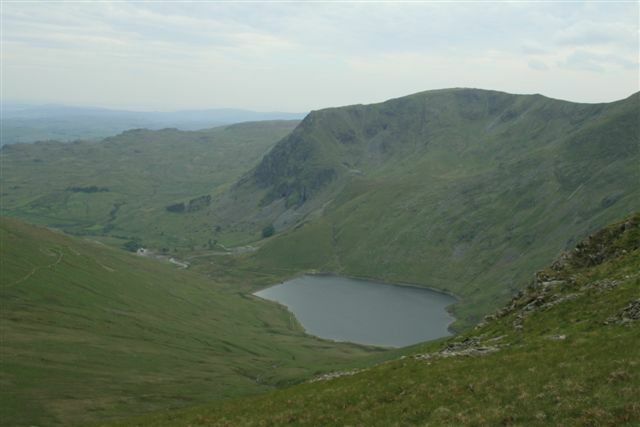 Should you wish to see better quality photographs of this Harter Fell walk please visit Harter Fell Walk on our Lake District Walks Flickr account. Please feel free to comment below on Harter Fell walk share or even hit the Face Book like button. I trust you enjoyed my Harter Fell walk. Is a great pub quiz question: which high street in England has no shops at all? 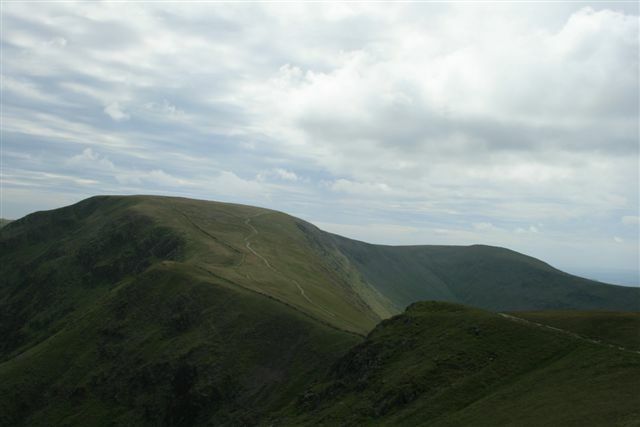 The answer is the fell of that name – High Street is the highest summit in the Far Eastern fells at 2,700ft, making this an exhilarating walk. The summit of High Street walk is also known locally as Racecourse Hill, from the days when horse racing took place upon the vast flat summit. The Romans built a road along the crest of High Street between forts at Ambleside and Brougham, near Penrith. The ascent of High Street from Mardale in my opinion is the most rewarding as it is somewhat removed from the ever popular tourist destinations of central Lakeland. 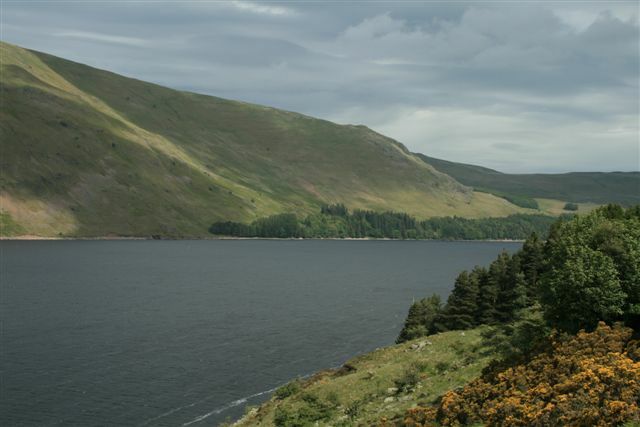 Traveling to Haweswater reservoir and along the road that traverses the lake with little traffic and probably no mobile phone signal set the theme for a day’s walk of peace and quiet. The road comes to a dead end at Mardale Head where there is currently a small free car park. 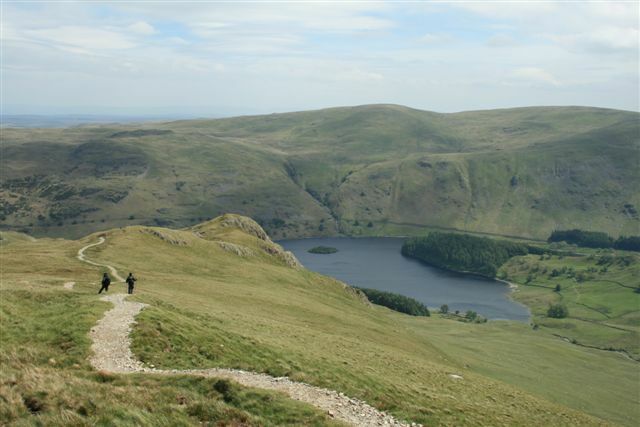 There are several routes one may take to ascent High Street walk, although for some, too complete 3 Wainwright fells in one day is a great achievement and this can be done with an approximate 5 to 6 hour walk. Weather and your level of fitness permitting, whilst I managed to complete the walk in just less than 6 hours. Taking my time, taking pictures as I walked and enjoying the fantastic scenery. Leaving the car park follow the path around the lakes edge until you reach The Rigg, which is the large bit of land extended into Haweswater reservoir. 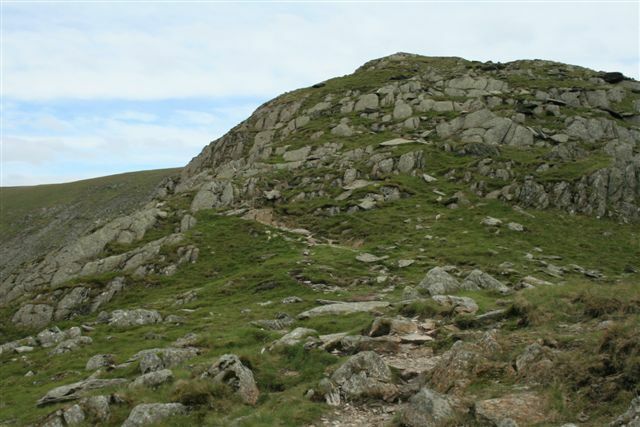 The most popular route is to now take Rough Crag, although I had decided to make this High Street walk, a bigger circular walk and to ascend via Kidsty Howes leading to Kidsty Pike. Kidsty Pike being the first of the Wainwright fells complete on this days walk. During this first section of the walk up Kidsty Pike you will be on the coast to coast walk route traveling generally east to west. 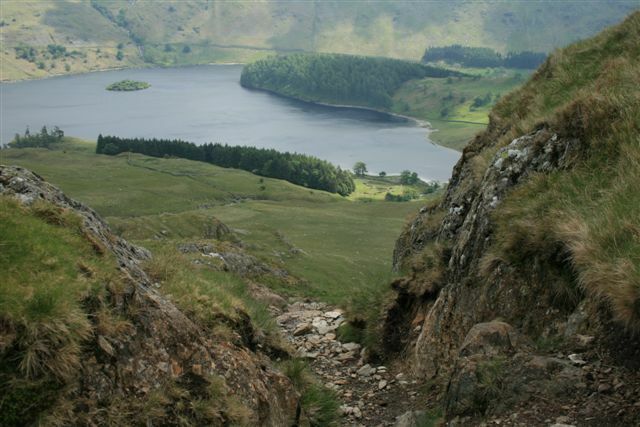 With the initial ascent of Kidsty Howes the path is clearly marked although rather steep, whilst quickly gaining altitude and not forgetting to turn and take in the view of Haweswater below. There is a rather rocky trail as you reach the top of the upward climb, which can be slippery so good boots are recommended at this point. Clearing the rocky crag you have a nice walk along Kidsty Pike, whilst if you now look towards your left you will now clearly see Rough Crag, home to the only Golden Eagles in England. Having spoken to several locals it is believed to be only the male eagle now alive, alas no Golden Eagle today. As you round the summit of Kidsty Pike Hayeswater will come into view as you descend slightly to your left towards High Street where you will see a small dry stone wall. Here there is a little confusion in the footpaths and I would recommend following the dry stone wall as this will take you to the summit of High Street marked by an Ordnance Survey triangulation point. This being something of an anti-climax with an almost flat top. On a clear day it is possible to see all the way to Shap and the Pennines, along with the quarry at Shap. 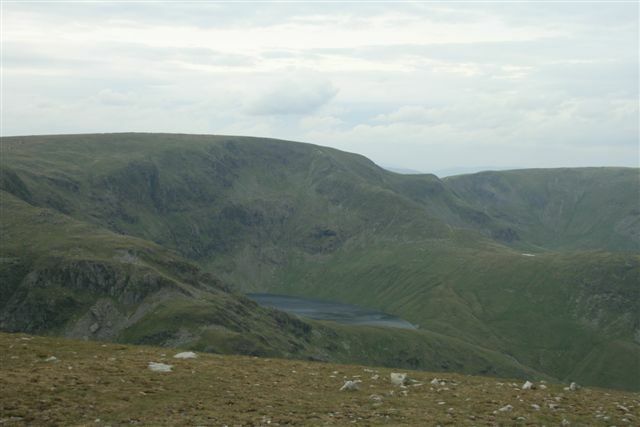 In the opposite direction you will have stunning views weather permitting towards Helvellyn and Striding Edge. I believe that it is only through taking this route that you will fully appreciate wherein the name High Street has evolved from the Roman times, as the marching Roman’s would probably have been safer on the top of the world as opposed to marching in the valley’s below. You can imagine the summit being busy with troops passing each other on army business. 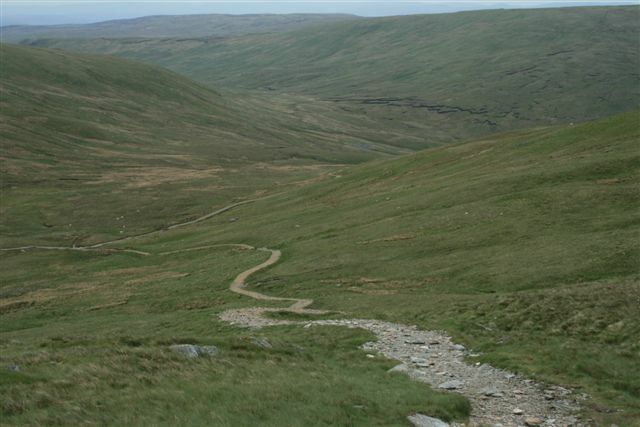 Continue walking with the stone wall on your right until you come to a definitive fork in the path and taking the left fork towards Nan Bield Pass. 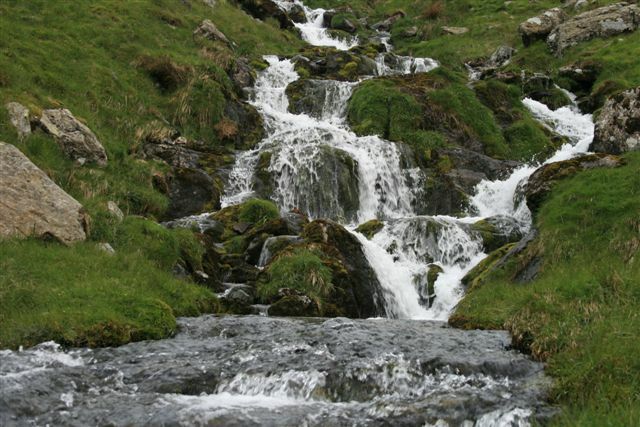 Here dependent upon your level of fitness and the weather conditions it is possible to continue on to Harter Fell, or alternatively descend via Small Water. Should you decide to continue on to Harter Fell this would be your third Wainwright fell to ascend within the one walk and in one day. For the purposes of this walk I am now going to split my walk into 2 and from here I would recommend continuing down the footpath and pass Small Water to your right on the clearly marked footpath returning to the car park. Should you wish to continue on to complete the 3 Wainwright fells and wish to see my description of this extended walk plus the pictures I have taken please click the link Harter Fell walk. Should you wish to see better quality photographs of this High Street walk please visit High Street Walk on our Lake District Walks Flickr account. Please feel free to comment below on High Street walk, share or even hit the Face Book like button. I trust you enjoyed this High Street walk and found it helpful.